I focus on the iconography of “girly imagery” and “cute culture” in order to utilize its tropes and aesthetics to construct sculptures and abstracted paintings that expose the structure of underlying cultural identities, landscapes, and visual strategies. 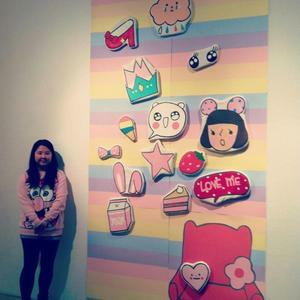 As a first generation Korean-American, I approach these visual themes as a participant and spectator, examining the “girly”, ultra-feminine representation of female identity present in products, the media, and popular culture. I mine the components that define cute and girly imagery in order to understand my own desire for these good, despite being aware of the imagery’s manipulative influence on perceptions of female beauty and behavior. Through my work, I wish to convey how cute culture has become synonymous with femininity and create a conversation about how we digest manufactured notions of feminine identity.